Article first published as Blu-ray Review: Senso — The Criterion Collection on Blogcritics. Luchino Visconti paints with bold strokes in Senso, an unashamedly adorned film where nearly every frame yanks the viewer in by the collar with its packed decadence. It’s visually arresting and visually demanding — it’s gorgeous to look at, but also requires a willingness to rove about the precise compositions and take in shots as if they were highly detailed paintings. If the story seems a tad thin at times in the film, it’s important to remember that everything is serving the visuals in Senso, and taken on that level, the film has an intoxicating effect. 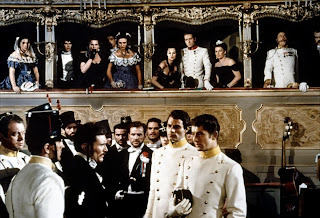 This puts us in the same place as Countess Livia Serpieri (Alida Valli), a loyal Italian woman who nonetheless finds herself under the spell of Austrian Lt. Franz Mahler (Farley Granger). The film takes place during the period of Risorgimento, in which Italy looked to free itself from foreign occupiers. The opening scene occurs in the impossibly lush opera house Teatro La Fenice, where the countess goes to Mahler to intercede on behalf of her cousin (Massimo Girotti), a fervent freedom fighter who insulted Mahler. But she is seduced quickly, with almost no apparent effort from Mahler, who Granger plays with a cool aloofness that develops into something darker as the film progresses. Rather than simply falling in love with a man, the countess seems to be swept up in the heightened drama of the situation — a place where consequences be damned — and Visconti’s photography embraces her lust with the full force of the breathtaking three-strip Technicolor film stock. The love affair between the two follows an expected tragic path, and as many have observed, the actual opera the film opens with leads to a film abiding by an unmistakably operatic sensibility. Valli plays the part with wide-eyed desperation, and it’s really not love we see in her eyes, but the look of a woman who’s been swept into something she can’t control. Granger allows his character to slowly reveal a sly malevolence toward the countess. His lack of genuineness is only heightened by the Italian dubbing over his spoken English lines, which here creates a distinct distancing effect. Senso demands attention, and like the woebegone countess at the center of it, it threatens to pick one up in a whirlwind of feeling. Senso is presented in 1080p high definition with an aspect ratio of 1.33:1. The film’s three-strip Technicolor photography looks superb, and the detailed digital restoration that was applied to the warped film elements is another impressive rescue from the Film Foundation. There’s an incredible amount of detail to be found in every shot — most of which are long shots packed with visual information — and the image has excellent clarity and depth. The slightly unreal color tones are magnificent, especially noticeable in the whites and yellows of the Austrian uniforms and the red, white, and green confetti that fills the opera house in the opening sequence. There’s hardly an instance of damage to comment on here, and the bright and film-like appearance of the transfer is outstanding. Audio is presented in an uncompressed monaural track that is clean and free from any hissing or popping. The dubbed dialogue tends to sound a little hollow and tinny at points, although that’s likely inherent in the technique. The operatic score has a little more weight to it, and comes from the fronts with full force. Included in this set is The Wanton Countess, the English-language version of the film that was released in U.S. markets very briefly after a long delay. This version had about 30 minutes excised, and is mostly a curiosity, but it’s a great extra, if only for the fact that we get to hear Granger and Valli’s lines spoken by them in English. The best extra here is a 30-minute visual essay by Peter Cowie, who brings his typically insightful viewpoint to a thorough history and analysis of the film, moving from the original desire to cast Marlon Brando and Ingrid Bergman to the political problems the finished film faced, and discussing Visconti’s visual strategies. Also excellent is a 30-minute-plus making-of, which features interviews from cinematographer Giuseppe Rotunno, assistant director Francesco Rosi, costume designer Piero Tosi and Visconti biographer Caterina D’Amico. Further exploring Visconti’s connection to opera is another featurette that pushes past 30 minutes. A nearly hour-long BBC documentary from 1966 looks at the three areas Visconti excelled in — theater, opera, and film. The set also includes a booklet with an essay by author Mark Rappaport and an excerpt from Granger’s autobiography, in which he recounts his experiences working on the film. The perfect complement to Criterion’s release of Visconti’s The Leopard, this release of Senso could hardly be improved upon.